I'm a confessed Rob Liefeld fan, so I like this X-Force costume. It's purple with a white stripe down the center, brown boots and gloves, and a bulky jacket. He's got aviator goggles - a clever costume element - and his hair sticks out of the top of his mask. The grimace on his face is pure Liefeld! 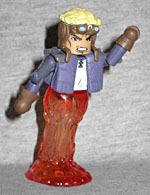 Cannonball has one accessory, a translucent orange display stand that simulates his ability to explosively fly through the air. It's a new piece, better than the reused Iron Man stand that came in the New Mutants box set. This one only has a solitary peg - designed for the waist, rather than the feet - so it's centered instead of being off to one side. It still has a slight angle to the front, to make him look dynamic. Shatterstar is Gaveedra Seven, the product of bio-engineering on another dimensional world, who was at one point merged with an Earth mutant named Benjamin Russell. Shatterstar possesses super-human abilities relating to the absorption of sonic and vibrational energy, as well as an intuitive learning capability. Shatterstar eventually served with X-Force, and has been involved in numerous superhuman conflict. Is that right? I don't think anyone ever knew what Shatterstar's powers were. But absorbing sonic energy? That isn't doing anything to do away with the "Shatterstar is the son of Longshot and Dazzler" tease that was going on for years. His costume is mainly white, with grey on the outside of the legs and a black star on the chest. His cape and one ridiculous shoulderpad are a separate piece around the neck. 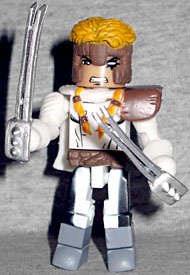 He has a new head cap to create his stupid hair and his face-pad, and comes with two of his double-bladed swords. Cannonball and Shatterstar may look dated, but admit it: you'd rather have them in these costumes than any other.